Being able to brew a single cup of coffee with a push of a button is a precious time saver. No wonder then that single cup coffee makers have been surging in popularity over the past few years. What started out as a Keurig-dominated field has grown to include Tassimo, Nespresso, and Starbucks owned Verismo. Instead of just coffee, now you can brew almost any kind of latte, cappuccino, or mocha you can order at a cafe. It’s hard to argue with convenience! Of course each of these coffee makers has their own ‘ecosystem’ with proprietary ‘k-cups’, ‘t-discs’ and other pods that are incompatible with their competitors machines. For each machine we’ll mention how wide a selection of coffee you can get with each coffee maker, as well as ways you can ‘get around’ their ecosystem! So the big question is: which coffee maker is best? 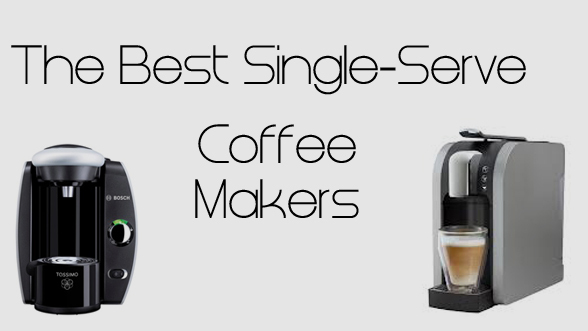 We have ranked the single coffee makers according to quality of beverages (i.e. tastiness), Convenience (i.e. how much clean up and maintenance is needed) and Speed (i.e. how fast they brew). Starbucks stores used to carry the Tassimo coffee machines, but decided to manufacture their own single serve brewers that were specifically designed to brew Starbucks brand coffees. You can enjoy lattes, Americanos, as well as Starbucks’ signature coffees like Pike Place Roast and Guatemala Antigua. Pros – This machine is fast. You do a rinse cycle to warm up the machine (and your coffee mug) and then brew your beverage of choice. The whole process can take under a minute. The machine is also slim and doesn’t take up much space on the counter. The milk-based beverages are also quite tasty: comparable to what you would get in a Starbucks on any given morning (minus thte trip). The milk is not the awful tasting ‘powdered milk’ you’ll find in many other pods, and when you brew a coffee it tastes quite good. Not quite as good as milk that’s freshly aerated, mind you, but quite good considering you just pushed a button. Cons – Need to flush out the system after every use (with milk involved, it’s understandable). The front tray isn’t adjustable, which means you need to remove it to brew a standard-sized beverage. This means you have an extra piece that you need to put away in the cupboard. Overall – There are upsides and downsides to specificity: the Starbucks based beverages are quite tasty, but you can only brew Starbucks’ beverages in this machine. If you like having a Starbucks beverage each morning but want to skip the long lines/disinterested Baristas, this coffee maker is a great solution. Whereas Keurig focuses on making drip coffees, Tassimo focuses on making a variety of beverages like lattes, caramel macchiatos, hot chocolate, and more. It does this task by having specialized bar-codes on the side of T-Discs (the type of pod Tassimo machines use). The bar-codes instruct the machine on the right amount of water and pressure needed to make an ideal tasting beverage every time. Pros – The milk-based beverages are quite tasty (they use the same ultra-pasteurization technique as the Verismo pods). They also have a much wider selection of beverages and manufactuers to choose from. The built-in water filtration also ensures that you get a consistent tasting cup every time. Cons – In an effort to save space, the water tank is 61oz. It isn’t tiny by any means, but it means frequent fill ups. The instructions for beverages are also for 8oz., so I ended up using two T-discs for every beverage. I didn’t mind it, but it can add up. (you could just add hot water to top it off, but I’m far too fussy for that!). Overall – If you’re looking to make lots of milk-based beverages but don’t like the limited choices that the Starbucks Verismo offers you, then this is a great option. Check out our Keurig vs. Tassimo comparison here. Imagine if you could have pure espresso shots in your home without having to grind beans, pull the shot or clean up the resulting ‘hockey pucks’? The Citiz gives you the convenience of a push button espresso machine and costs less than most low-end manual espresso machines. The Citiz is uses eco-friendly aluminum capsules to make espresso *you don’t have to worry about storage temperature or anything like that). The Citiz has developed quite the following in Europe, where it’s convenience and ultra-modern look are a perfect fit in European lofts. Pros: – This is the best tasting espresso of all the single-cup coffee makers. The Citiz even gives you the option of regular or ‘long’ espresso shots, which is a nice feature since I tend to order my Americano long. Cons: – It makes espresso really well, but this model does not do milk-beverages. You can get the Nespresso Citiz + Milk for $299, which also features a milk frother. Overall: – This coffee maker has the best tasting espresso (and looks amazing), but it’s limited in what it can do. If you’re looking for a convenient and high quality espresso machine, this is a great option. If you get the Citiz + Milk, you will also be able to make your own lattes and cappuccinos. Anyone who has worked in an office environment in the past few years has probably encountered a Keurig Brewing Machine. The first major single-serving brewing system to hit North American shelves uses proprietary K-cups for their brewers. Most major coffee companies (including Starbucks) sells their coffee in K-cup format. Keurig is known for brewing coffee, but has also expanded their K-cup line to include hot chocolate, tea, and cider. Pros: – If you want a great tasting cup of coffee in under a minute, you can’t go wrong with the Keurig. You have a wide selection of coffees to choose from. Plus if you get a reusable ‘Solofill’ cup, you can use any freshly ground coffee you want in your brewer. You can also have hot water instantly at the press of a button (for soup, or tea). Because K-cups are so ubiquitous now, the cost has come down and it’s not a very budget friendly way to get a quick cup of coffee. Cons: – Keurig hasn’t become a viable machine for making milk-based beverages yet. They have come out with the ‘Keurig Vue’ machines, but reviews are underwhelming and there aren’t many milk-based K-cups available. Overall: – While the drip coffee is not as high quality as the Verismo, you have hundreds of options (not just Starbucks’ coffees). It’s a great device to have in your kitchen, as you can have instant coffee whenever you want. The water tank is also quite large, so you won’t be needing to refill it all that often. Like the Nespresso coffee maker, Nescafe has a ‘vertical integration’ where they make the coffee makers and the capsules. The result is that, as tasty as some of the drinks are, you can only use Nescafe beverages. You can check out their website to see their selections (I recommend the Caramel Latte Macchiato). They do have a couple dozen options (including iced coffee! ), but you are stuck in that ecosystem. Pros: – The Piccolo is the most budget friendly of the Nescafe machines, and it looks adorable. It has the shape of a penguin. It is convenient to use and looks good doing it. Some of the sweeter drinks are quite tasty. Cons: – The milk used is powdered milk, which means that there’s a certain aftertaste that I didn’t like. The sweeter beverages overshadowed it, but overall I found Nescafe’s lattes to be inferior to Tassimo or Verismo. The beverages also took a long time to pour: about 90 seconds overall. Overall: – While the milk-based beverages suffer from Nescafe using powdered milk, the machine is a budget friendly option for people looking for single serve espresso beverages without heading out to a cafe. If you’re going to use your coffee maker mainly for drip coffee, then a Keurig would be the more budget friendly option long term (when you add up the cost of capsules vs. K-cups). There you have it! We have dozens more Single Cup Coffee Makers in our Coffee Shop. Feel free to visit anytime! Previous What is Kona Coffee?